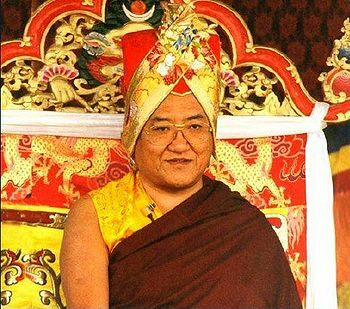 Kyabgon Gongma Trichen Rinpoche, previously known as His Holiness Sakya Trizin (Tib. ས་སྐྱ་ཁྲི་འཛིན་, Wyl. sa skya khri 'dzin) (b. 7 September 1945), was the previous throne holder of the Sakya order of Tibetan Buddhism, the 41st patriarch of the Khön lineage which dates back to 1073. He is renowned as an emanation of both Manjushri and mahasiddha Virupa, the founder of the Lamdré teachings, and also as an incarnation of Apang Tertön. He is a brilliant master who manifests profound wisdom and compassion, and his excellent command of English render his teachings particularly beneficial to western students. He was born in 1945 in Tibet and escaped with his family to India in 1959 where he continues to live and rebuild both the lay and monastic elements of the Sakya tradition. He has guided the establishment of over thirty monasteries in India and Nepal and has helped found Sakya centres around the world. His elder sister is Jetsün Kushok Chimey Luding. He has two sons, Khonrig Ratna Vajra Sakya and Khondung Gyana Vajra Rinpoche. 15 August-3 September 1978, Dzogchen Orgyen Chöling, London, UK—teaches on Mahayana and Vajrayana in the context of Lamdré. Gives Manjushri, Vajravarahi, Hevajra, Chenrezik from Thangtong Gyalpo & Vajrakilaya from Jamyang Khyentse Chökyi Lodrö empowerments. October 1984—spends eight days at the London Rigpa centre; gives the empowerments of Manjushri and Vajrakilaya and teaches on 'The Triple Vision', 'The Teaching of Buddha in Everyday Life' and the 'Nature of Mind'. 28-30 March 1989—teaches at Cornwall retreat, UK; gives Vajrakilaya & Manjushri empowerments. 3-4 April 1989—teachings in Paris. October 1991—gives the Khön family lineage empowerment of Vajrakilaya in the London centre. His monks perform the sacred dances associated with the ritual at the Shaw Theatre. May 1995—H.H. Sakya Trizin and Jetsün Kushok Chimey Luding visit Rigpa London. Teachings on Parting from the Four Attachments are given. 21 May, H.H. Sakya Trizin gives a Vajrakilaya empowerment. 14-15 September 1996, Paris, Salle Adyar, 'The Healing Power of the Mind' event—teaches on healing in the context of the Four Noble Truths and gives a Vajrasattva empowerment. 28-29 September 1996, Lerab Ling, 'Wisdom and Compassion' event—teachings on the heart and essence of the Mahayana, and gives Chenrezik and Manjushri empowerments. 3-4 June 2000, London Rigpa—gives an empowerment. 22-23 June 2007, Lerab Ling—gives Khön family lineage empowerment of Vajrakilaya. 3-7 July 2010, Rigpa Berlin Centre. ↑ Official letter of the Sakya Dolma Phodrang, 5th April 2017. ↑ His fuller name is: Ngawang Kunga Tekchen Palbar Sampel Wangi Gyalpo. ↑ In the lunar calendar: 1st day of the 8th lunar month of the Wood Bird year. ↑ On the 9th of March 2017, his son Ratna Vajra Rinpoche was enthroned as the 42nd Sakya Trizin. This page was last edited on 27 October 2017, at 09:21.